Are you an oenophile? If so, then combine your love for each other with your love of wine and share your knowledge with your guests! One interesting idea is to replace the standard open bar with wine tasting stations. Check with your favorite wine store or vineyard about the availability of hiring an expert or two to help serve. Choose wines that have special memories for you and your fiancé! Your guests will love choosing their own wine. And you will now have new memories to associate with a favorite vineyard! When choosing your decorations, consider using the rich colors of burgundy and chardonnay as accent colors to your reception hall. Tables can feature centerpieces that include grapevines and grapes with a beautiful candle in the middle. 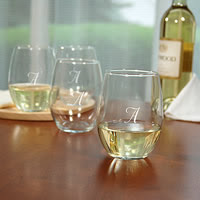 At each place setting include a personalized wine glass engraved with your names and wedding date for an extra special touch. 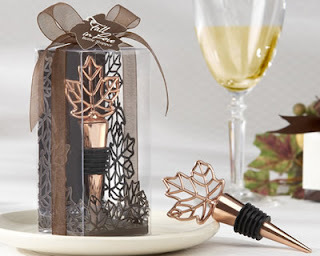 Another great idea for a wedding favor is a wine bottle stopper. With so many different styles available, you are sure to find the perfect one for your wedding guests. 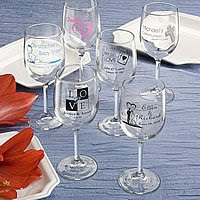 You'll find many wine-themed wedding favors and wedding party gifts at WhereBridesGo.com! Be sure to use coupon code BLOG at checkout to take 10% off your entire order! Are you having a wine themed wedding? 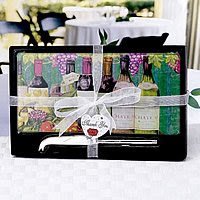 Or did you already have a wedding where you integrated a wine theme? Tell us about it! Comment on this post. We'd love to share your ideas with other brides!